The presumable audience for Enlighten Up! 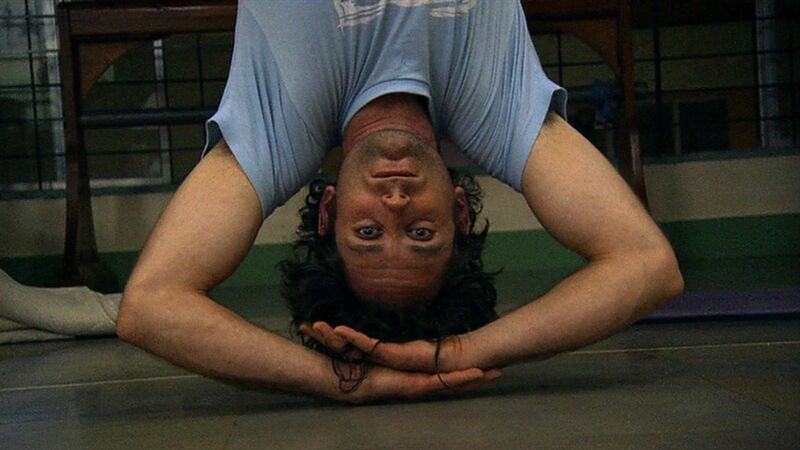 is skeptics; not only of yoga, the documentary’s subject, but of guruism in general—the notion that self-actualization can be had by leaping onto a philosophical bandwagon. Director Kate Churchill, appearing on camera throughout the film, is hardly shy about her own reservations with yoga, despite practicing an Americanized version of it for years as a physical fitness and calming technique. Hoping to assuage her (and our) intense doubt over the fad, she recruits an out-of-work anti-transcendentalist journalist (Nick Rosen) and submits him to a globe-spanning crash course in body-contorting postures and mind-numbing Eastern philosophy in the hopes of achieving Bodhisattva by proxy. Churchill’s interpretation of the Super Size Me premise poses an intriguing challenge to the godless viewer, who subconsciously yearns to be proselytized so that he can prove himself impervious to the delusion of religious transformation. We root whole-heartedly for Nick, the film’s symbol for our incredulousness, since he reveals himself as a tough atheist nut to crack. But as Nick and Kate explore yoga’s many manifestations, the deck appears increasingly stacked. How can the most bizarre adherents of an essentially spiritualist institution convert a pragmatist, especially one with such clichéd filial angst (we learn eventually that Nick’s worldview springs from friction between his practical, legal counselor father and his spacey, New Age mother)? Furthermore, the most advanced yogis the filmmakers interview (Norman Allen and the remarkable B.K.S. Iyengar) suggest that yoga has no desire to argue with agnosticism in the first place: The technique is simply one of many distinct paths to the destination of self-fulfillment. This truism, affixed as a denouement, renders the entire film as a trifle silly—particularly the trumped up sparring between Churchill, who feels Nick’s heart isn’t in the project, and guinea pig Rosen, who’s merely holding his own as an occidental fish out of water. Enlighten Up! examines the astounding diversity and confused historical background of its subject quite well, but the central gimmick inspires one to paraphrase guruji Louis Armstrong: He who has to ask what yoga is never gets to know.